The first shot of Foxtrot is through the windshield of a vehicle careening down a desolate country road. It’ll be a while before the full significance of this image is revealed, even to those who suss out the gist of it through context clues. But it’s painfully clear what kind of story Israeli writer-director Samuel Maoz intends to tell by the time he reaches his second shot: a medium close-up of a woman opening a door, processing the appearance of the offscreen strangers standing before her, and promptly fainting. The woman is Daphna Feldmann (Sarah Adler), and it’s momentarily disclosed but instantly obvious that the strangers are men in uniform, at her front door to make her worst nightmare—to make any parent’s worst nightmare—a reality. They don’t have to say a word. She knows why they’re there. She knows her son is dead. Foxtrot is about what happens next, about the rage and the grief a couple grapples with after this horrible visit. (When Daphna collapses out of frame, her absence reveals a painting that’s just a cluster of black lines, creating a mess of inky darkness at its center—a good visual representation of the abyss that’s swallowed up the Feldmanns.) But the film is also about what happened before, to the dead soldier and to his father, whose own past intersects with the current events in surprising, speculative, perhaps fatalistic ways. 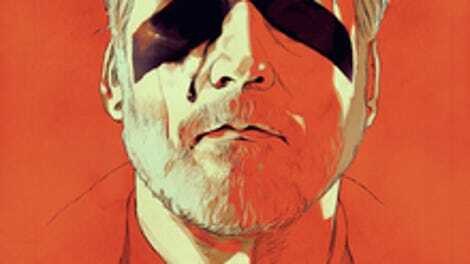 Heavy with horror though it may be, Foxtrot turns out to be too conceptually and stylistically audacious to be called a slog; it keeps throwing curveballs, some crueler than others. The film is divided into three distinct passages (or four, if you count a brief, poetic animated interlude). The first chapter is set immediately after the awful news has been broken. While Daphna, heavily sedated, collapses into an uneasy sleep, her bereaved husband, Michael, stumbles through the difficult hours that follow in a state of shock. He’s played by Lior Ashkenazi, the Israeli star of Footnote, Big Bad Wolves, and Late Marriage, and an actor capable of conveying raging tempests of feeling with just his eyes—a very valuable skill, in this case. Michael’s ordeal unfolds in vivid, granular detail: the alarm on his phone going off every couple hours, reminding him to keep drinking water; the well-meaning but infuriatingly mechanical advice of a young soldier who comes to discuss funeral arrangements; the father listening to his son’s voicemail over and over again, just to hear his voice. Then comes a new shock. 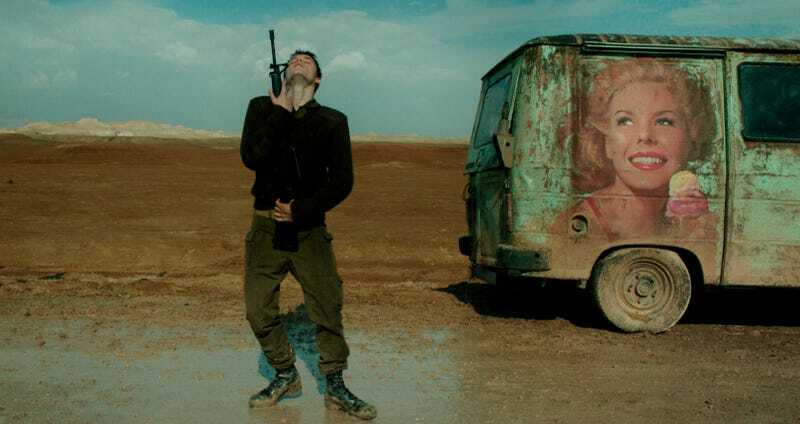 Maoz, who made the four-men-in-a-tank war drama Lebanon, keeps this intimate material visually interesting, though one could debate the necessity to gussy up wrenching grief with exaggerated, unconventional camera angles. (We can tell Michael is in a prison of emotion long before Foxtrot frames him from above, making the four walls of a bathroom look like a cell.) But the director really flexes his formal muscles with the second chapter, where we finally meet Michael and Daphna’s son, Jonathan (Yonaton Shiray), stationed alongside three other young soldiers at an almost comically secluded checkpoint. It’s an oasis of tedium, and Foxtrot applies the same surreal, quotidian specificity to these scenes of eerie isolation (is it possible to feel cabin fever when surrounded by miles of open land? ), only with lots more striking imagery, like the brilliant light of an exploding flair reflected in a puddle of muddy water the troops trudge through. Like a miniature, spookily quiet Jarhead, this self-contained section presents war as excruciatingly inactive. Until it isn’t. When Foxtrot won the Grand Jury Prize at Venice this year, Israel’s minister of culture condemned the film, which she may not have even seen, for promoting a negative, misleading impression of the Israeli Defense Forces. To understand her (again, possibly abstract) objections, one would have to know more than this review should disclose. Likewise, to say much about Foxtrot’s final chapter, which pulls everything together in a pretty crushing way, would be to spoil the harsh, strange architecture of Maoz’s nonlinear narrative. So let’s just say this: Like any film that depicts the daily boredom, loneliness, and fear soldiers experience—as well as the gauntlet of suffering visited upon their parents when they’re killed in action—Foxtrot can be considered anti-war and perhaps even anti-military. But it plays less like a specific indictment than something more mysterious: a tale of lives at the mercy of cosmic, karmic design. By the time Maoz has brought his film full circle, returning to and finally clarifying his first shot, a sense can be made of what’s happened to this family. But there’s not much comfort in that sense, for them or us. Correction: This review initially misidentified the gender of Israel’s minister of culture and sport, Miri Regev.